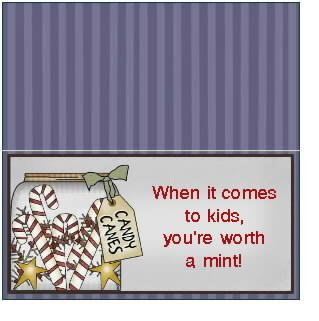 Behind My Red Door: You Are Worth a Mint! You Are Worth a Mint! Hello - is anyone out there?? I am feeling so isolated LOL! Except to get my stitches out yesterday, (I have a little relief) and helping my parents at their house twice since Thursday, I haven't been out of the house in over a week. Several social engagements were canceled and nothing will happen today, that's for sure!! Mother nature is dealing us another cruel blow. We have 2-3 inches of snow on the ground with sleet now coming down on top of that. A little sun tomorrow and then SIGNIFICANT accumulations of snow on Friday. We all just pray that my parents street gets hooked up to power tomorrow when the sun shines again briefly. I won't go into details, but even though we are all doing the best we can to make them comfortable here, they are just so tired of not having their comforts and worrying about the cat. The fact that my dad has a significant handicap and mobility issues really doesn't make it easy to "make-do" as so many people suggest. They could stay here as long as they wanted - but they don't WANT to be here and it is really wearing on them today. Please keep them in your prayers so they can get home where their environment is set-up to accommodate them and not vice-versa. Thanks so much! On a more cheerful note, a dear friend made and sent me this pretty little tuck in pillow for Christmas. Isn't it darling? I love how I can tuck it so many different places. It is so Colonial and perfect! I am trying to find ways to make my mom feel included so last night, we made up the dough for David's favorite cookies -Shortbread. It's the only kind I am making this year. I ran out of time with all that has been happening. We all love them so I am not stressing about making any more. The recipe is simple: 1 cup of butter - no shortcut's here. You need to use the real thing. Cream that with 1/2 cup of sugar. Add 1 tsp cocoa powder. Then slowly add 2 1/2 cups all purpose flour. My DH's late Nana kept the cocoa part secret for years and wouldn't tell me why mine didn't look like or taste just like hers. She also insisted you had to work the flour in by hand. Well if I can find a way to simply something without altering it's integrity, I am all for it. So this is how I make mine... in my stand mixer with the paddle. It works great and my cookies now taste just like Nana's. Once you mix the dough, you need to cover it and chill it for several hours or overnight before you make the cookies. This is what it looks like all mixed. When my mom is up to helping me bake, we'll make the cookies and I'll post the rest of the pics next time. Yesterday I shared a cute idea for Reindeer food and promised another cute idea today. Please refer back to yesterday if you missed it so this one makes sense. Using any of the graphics below, you make a bag topper and fill the small bag with either mini candy canes, or starlight mints. You can make it more personal by using a child's name, or changing the word kid to parent, brother, sister, teacher etc. I have a few more cute Christmas ideas similar to these and I will share them and our cookies, the next time I get a chance to blog - hopefully tomorrow!! right now I am off to play short order cook. Until then, please stay safe and warm. I know many areas of the country and Canada are experiencing winter storms. Making headway and a beautiful sound. Reindeer Food - a fun idea!! The Fury of Mother Nature!! Honey Bunz and What in the World is Kugelis?